ClearOS is an open-source, Linux-based operating system (OS) that is designed from the ground up to be extensible. The OS provides any combination of network, gateway and server functionality to small/medium sized businesses, non-profit organizations, education/government and distributed enterprises. ClearOS can run either as a gateway or a standalone server. Since Netify is designed to provide network intelligence for your whole network, installing Netify on a standalone ClearOS server is neither useful nor supported. In the ClearOS web-based interface (operating on port 81), click on the "Marketplace" heading after logging in. Scroll through the app until you find Netify or enter "Netify" in the search filter. Click on "Select for Install" and click on the "Download and Install" button as you would install any other app in the ClearOS Marketplace. 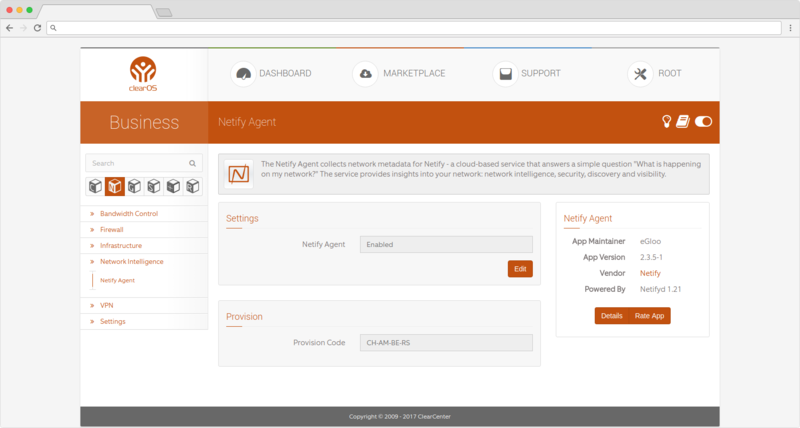 Follow the provided link in the web-based interface to provision your Netify Agent. Sorry, only command line installation is available in ClearOS 6. Copy and paste the web address shown in the command line output into your web browser, and then continue the provisioning process.